JJ walked from his home through beautiful border landscape to the Shrewsbury Folk Festival. The Patron’s Walk took 3 days, 20th to 22nd August. A beautiful walk from Presteigne [Llanandras] to Bishop’s Castle crossing the Teme and Clun valleys and passing through the remote area of Ragged Kingdom which gave Oysterband and June Tabor their iconic album title. We leave Presteigne at 9.00am for a total distance of 18 miles with some steady climbs. Starting from the bridge over the River Lugg on Broad Street, we follow the road and then a path to Stapleton and up through the wood, joining the road over Stonewall Hill with dramatic views over the surrounding hills. We then descend into the Teme Valley on the road and then walk a grassy track to cross the A4113 Knighton to Leintwardine Road at Stowe. Once through this secluded hamlet, we have a steep ascent up through Ragged Kingdom and over to Chapel Lawn with views of the ancient hill fort of Caer Caradoc. Following quiet lanes we crest Clun Hill with Clun Castle way down in the valley and descend to our lunchtime stop at The White Horse Inn. They finish serving food at 2pm and since the morning distance is 12 miles, we may not get there by then. However, there is a co-op supermarket nearby for provisions. This is a good morning walk. Drop out here if you wish and take your time over a drink. 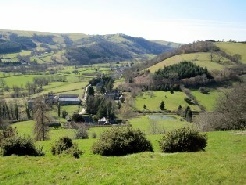 Walkers will leave at 2.30pm from Clun. Here we take The Shropshire Way through thickly wooded hills to the farming village of Acton and onto Bishops Castle. The afternoon walk is 6.5 miles and we finish at The Three Tuns, the oldest working brewery in England, with great beer and food. 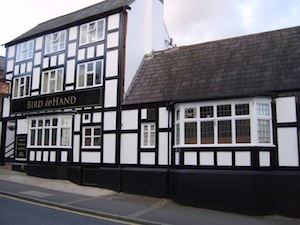 The Three Tuns is the home of the famous Shropshire Bedlams Morris side. 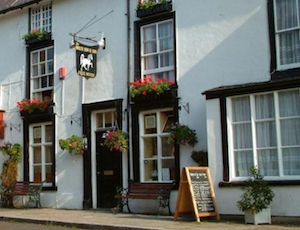 This evening, John and the The Reluctant Ramblers will play a gig in the upstairs room at the Three Tuns Inn. Tickets are all sold out for this show. This is a long first day with some big hills and rewarding views. Join us for part or the whole of it. Please email us at info@jj-rr.org if you plan to join us for all or part of this walk as it helps if we know how many people to expect. 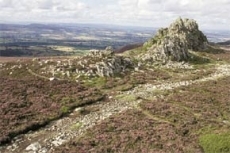 We walk from Bishops Castle to Pontesbury through classic border landscape to the rugged wilds of Stiperstones, a strange rocky moorland once mined for lead and barytes. We depart Bishops Castle at 9.00am from the 3 Tuns. We walk across the Onny Valley through Lydham village, passing the motte and bailey site at More then passing Lynley manor and ascending Lynley Hill through the avenue of beech trees. We then have a steep descent and then a steep climb to the beginning of Stiperstones through the ruins of a disappearing village and on to The Bog Visitor Centre in a Victorian school-house, the only building left of a mining community that once had 200 dwellings. We stop for lunch here at around 1.15pm. After lunch, we follow the ridge to the trig point 536m, our highest point, and pass Devil’s Chair through a strange landscape that has its unique atmosphere and industrial echoes. We stay high and remote until we drop down through woodland to Pontesbury. We finish at The Plough pub after a total of 17 miles. Please email us at info@jj-rr.org if you plan to join us for all or part of this walk as it helps if we know how many people to expect. The Reluctant Ramblers then take lifts into Shrewsbury for our first session at the Bird in Hand pub in sight of the Festival big top. This is a premier pub for sessions and we hope many will join us for the evening starting around 8pm. A 10 mile walk into the Festival site where JJ and the RR will kick off the weekend on the main stage. JJ is MC for the whole evening. A great start to a great weekend. We will meet by the school and library in Pontesbury to start at 10.30am. The walk will head east to the parking place below Pontesbury hill. We then take paths to Longden and then Great Lyth to meet The Shropshire Way which we follow all the way to Kingsland Bridge, arriving by 2.30pm to meet anyway who has walked out from the festival site. We then walk along the river, past The Quarry and Welsh Bridge and follow the river round to the site. Everyone must take care on the roads. Please email us at info@jj-rr.org if you plan to join us for all or part of this walk as it helps if we know how many people to expect. Meet us along the way or as we arrive. We’ll be heading for a welcome drink at the bar first and then backstage for our sound check and to open the festival on the main stage with a Ramblers set at 7.15pm. Brilliant idea! We hope to join you for some of it at least. On Friday 22nd August…should be amazing! Hope to join you you as you enter Shrewsbury. When do you think you’ll be getting to the Kingsland Bridge? We expect to arrive at the Kingsland Bridge between 2 and 2.30. Meet you there.